AUSTIN, TX (June 25, 2018) – Austin Parks Foundation (APF) is thrilled to announce their 2018 spring grantees that will receive over $170,000 in collective funding to improve various Austin parks, trails, and green spaces. Projects include new playground equipment, improved community pools, school parks, sports fields and more. Additional information on the specific park improvement projects and grant recipients can be found below. Additionally, as part of their new Park Design Services, the nonprofit just awarded the first-ever Master Plan to Pomerleau Pocket Park. The new initiative launched in 2018 in coordination with the City of Austin’s Parks & Recreation Department and is intended to provide design options to Adopt-A-Park groups at every scale. Master Planning is the most in-depth level of the new program and is awarded once every year. APF leads the design visioning process and guides neighborhood and pocket park groups to create a park master plan that will determine the long-range vision for the entirety of the park. Other levels of the Design Services program include detailed park design and design consultations. Requests for consultations are accepted on a rolling basis, and applications for detailed park design are accepted twice per year, on September 30th and April 30th. 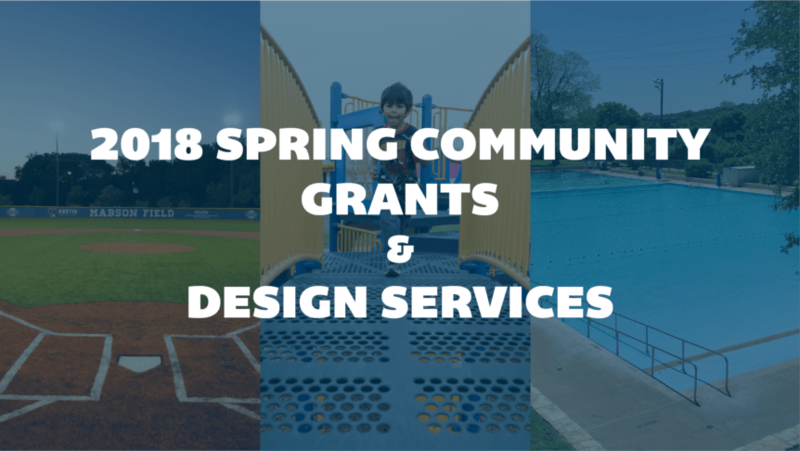 APF’s Community Grants are intended for larger community-initiated physical park improvement projects that require between $5,000 and $50,000 in funding like signage installations, trail building and planning, physical improvements and maintenance. These grants have been offered since 2006 and applications are now accepted twice a year. The deadline for the APF Impact Grant, an annual grant of $100,000 to support large, community-initiated, physical park improvements, is October 30. The deadline for Fall Community Grants and Design Services applications is September 30. To learn more about the Austin Parks Foundation’s ACL Music Festival Park Grants Program or Design Services and to apply, please visit www.austinparks.org.